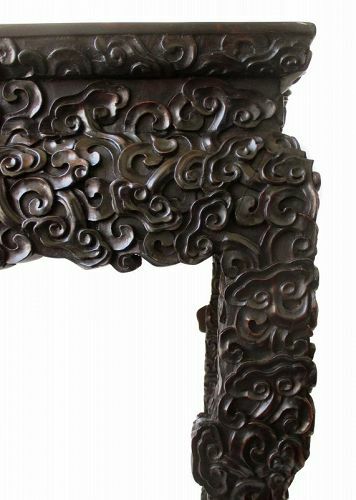 An incredibly large and heavy hand carved wood architectural piece, with high relief carved pair of dragons on either side of a central ball of light surrounded in sacred lingzhi clouds. Depicted is a pair of mystical dragon fish on either side, a traditional symbol in China of transformation and new beginnings. The carving floats on a custom steel plates and mounts. Antique Chinese 6-panel coromandel screen made of hardwood, possibly zitan. 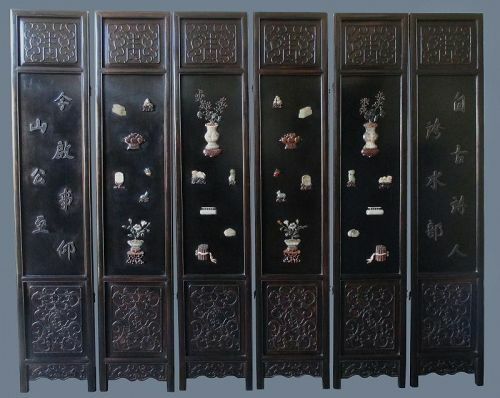 Inlaid with scholar items carved of various hardwoods and jade. All panels fit together with the original hooks and pins. In beautiful condition. Dimensions: 41 1/2" high x 90" long x 17 1/2" deep. Chinese altar table constructed of hardwood and bamboo with original red lacquer finish. The woven bamboo creates openwork motifs of geometric design from all sides. 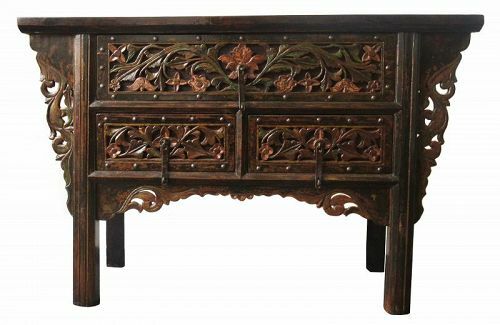 Dates from late 19th c to early 20th c.
Chinese hardwood coffer cabinet, with relief carvings throughout of floral motifs with pigments. The front of the cabinet holds three drawers, opened by brass pulls. 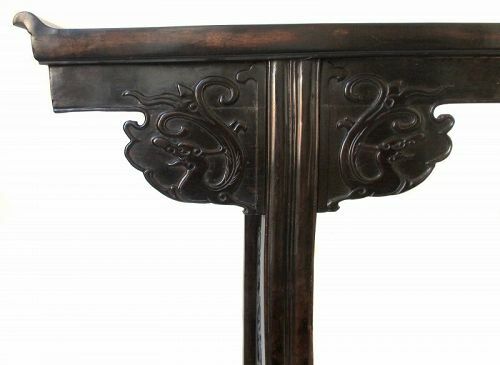 The sides and apron of the cabinet are carved with openwork foliate scrolls. 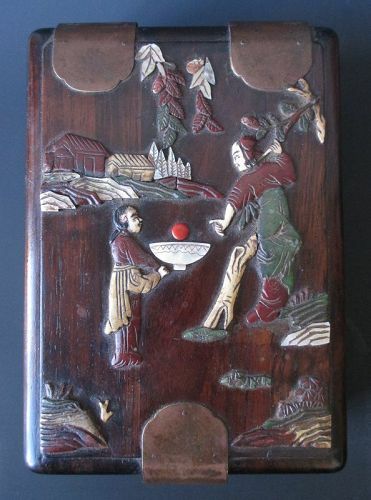 Dimensions: 51 3/4" x 17 1/2" x 33 3/4"
Chinese antique hardwood box inlaid with stone in a scene of figures in a garden. The hinged lid of the box opens to reveal a mirror underneath and a storage area for jewelry or cosmetics divided into six compartments. Dimensions: 2 1/2" high x 8" wide x 5 3/4" wide. Chinese hardwood painting table. The whole body, except for the top, is carved in relief with lingzhi fungus. The waist, the apron, and the connecting joints are also decorated. The legs are cabriole with block carved hoof feet. The everted flanges are joined to the end of the top and rail, and the spandrel is of two scrolling dragons carved in low relief. The legs of the table rest on horizontal feet. 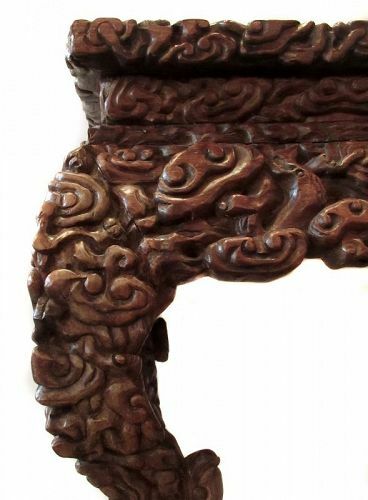 Between the legs are a carved pendant of double motifs of ruyi scepters and pair of scrolling dragons. 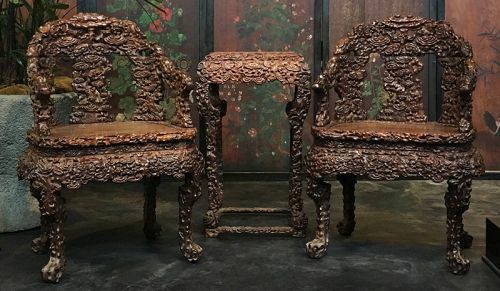 The set is entirely carved in high relief of lingzhi fungus intertwined and layered, creating an imaginative form of a deer, frog, and other figures. The throne-like chair with a waist, five panel slats and stiles, and slight carved cabriole legs all finely carved and connected. The tea table is waist high with a mitered corner and a smooth surface. The cabriole legs are supported with an additional stretcher for strength. The whole body, except for the top, is carved in relief with lingzhi fungus. The waist, the apron, and the connecting joints are also decorated. The legs are slight cabriole leg with block carved hoof feet. 65" x 33" x 25 1/2"